On April 24 wheat plots were scouted at the Arlington Agricultural Research Station located in Columbia Co., Wisconsin. 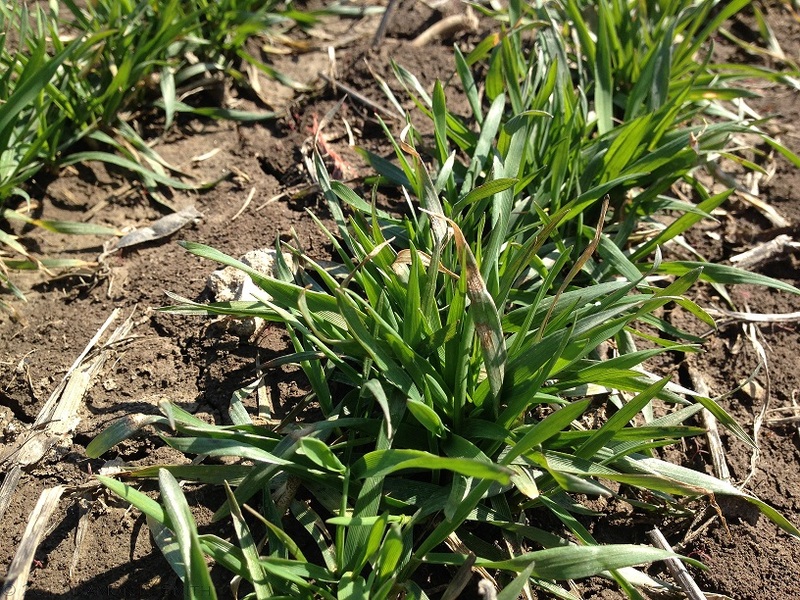 In general, wheat plants looked much better than they did at the beginning of April. Moisture and warmer temperatures has resulted in decent green-up. It is still pretty early to readily find symptoms and signs of disease. However, careful scouting of multiple locations in several fields at the research station resulted in identification of localized areas of Septoria blotch (Fig. 1). Septoria blotch is a disease that is often found in a complex with other leaf blotches. Recently we published a new fact sheet about leaf blotch complex of wheat and how to manage it. You can download a PDF of this fact sheet at this link: http://fyi.uwex.edu/fieldcroppathology/files/2013/04/Leaf-Blotch-Diseases-of-Wheat-1.pdf. The Septoria component of the leaf blotch complex is caused the fungus Septoria tritici. In winter wheat the fungus often infects in the autumn after leaves of newly planted wheat emerge. Symptoms may not appear until the following spring. 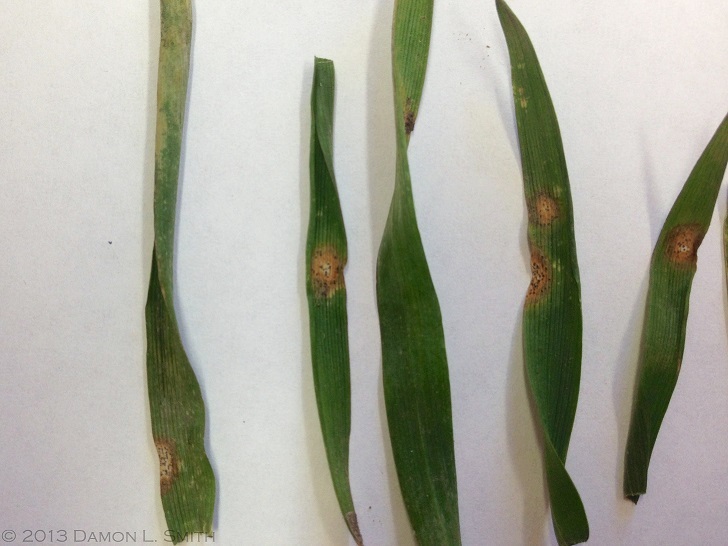 The primary symptom of Septoria leaf blotch is the appearance of elliptical tan lesions. Black, pimple-like fruiting bodies (pycnidia) are usually readily visible inside the lesions (Fig. 2). When weather is extremely wet and humid, spores can be spread from the fruiting bodies and splash to other leaves and cause infection. Typically two or more consecutive days of rain and wet weather are needed for infection to take place. If weather continues to be favorable, lesions can expand resulting in leaf blighting, and in more mature plants, spores can be dispersed upward into the plant canopy. Lesions observed during our most recent scouting trip are likely a result of infections that took place late in the fall of 2012. Symptoms and fruiting bodies are now being observed because weather is warming. Spread of this pathogen will be favored by continuous, wet weather. It is possible that some spores were spread in the last week to 10 days. However, looking at the most recent forecast, it looks like warm and dry weather will prevail for the next week or so. This should slow down any epidemic of Septoria blotch that was underway in most fields. Care should be taken to scout fields frequently for leaf blotches and other diseases as we move into spring weather. As mentioned in the fact sheet, management of leaf blotch can be accomplished through an integrated approach that combines use of resistant varieties, pathogen-free seed, crop rotation, proper crop debris management, volunteer wheat eradication, and fungicide treatments. At this point of the season, fungicides are not recommended. In areas with a history of severe leaf blotch diseases, and on wheat varieties susceptible to leaf blotch, preventative applications of fungicide to protect the flag leaf (Feekes 8 and 9 growth stages) may be necessary. Decisions to apply fungicides should be based on regular, careful scouting. Because heavy rainfall favors leaf blotch development, rain patterns should be considered when determining the frequency of monitoring for disease development. To assess the need for treatments, scout five locations within a given wheat field. Once two of the five areas have 25% or more of leaves showing symptoms of leaf blotch, scouting should be repeated approximately every 4 days. Once three of five areas have 25% or more of leaves exhibiting symptoms, then fungicide applications should be considered. Next post: Are Chances for Carry-Over Nitrogen Diminishing?